From a non-racing standpoint it was a really difficult weekend. We left Thursday night for Springfield so that we could get an early start practicing on Friday. During the drive up, the truck’s power steering pump began to make an unholy noise. After following incorrect GPS instructions, we arrived about an hour later then we expected. 10 pm is late for an 8 year old who needs to be alert in the morning. While unpacking for the night we discovered that our luggage for the hotel was left at home. This was a ominous beginning to our weekend. It was going to take a lot of determination to avoid these distractions. 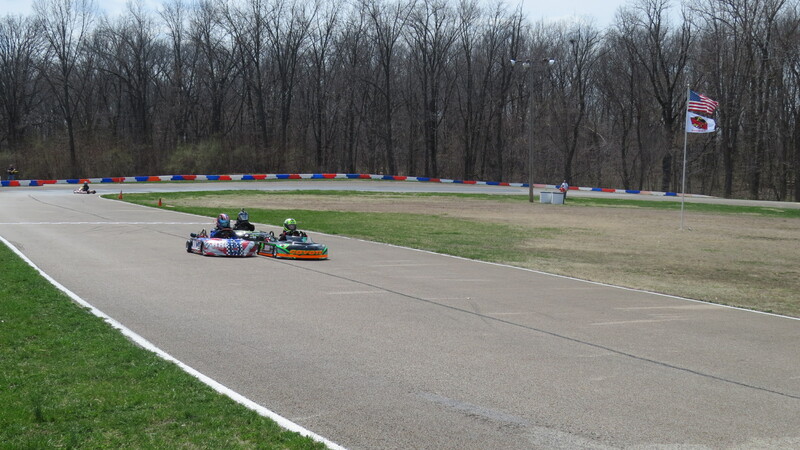 This was the first race weekend of the Mid-American Sprint Series, the first race of the season for the track at the Mid-West Kart Club, AND the first time Jason has been on this track. This track’s layout is good mix of Badger with its tight turns, Concept Haulers with its long straights, and Road America’s elevation changes, making for fast and technically difficult racing. It is very much like Jason’s favorite track Grattan, so much so it is currently his number 3 favorite, behind Grattan and Black Hawk Farms. 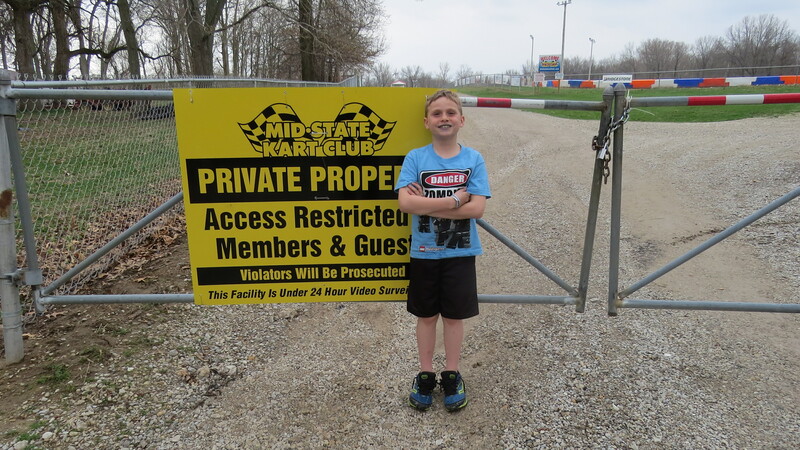 The Mid-State Kart Club is run and owned by the club, much like Badger Kart Club. This lets the track run as a non-profit organization and turn any profits back into the track and keeping the club and kart racing going. Concept Haulers is privately owned and are relies on making a profit to support the track’s owners. Club owned tracks make for best racing experience because everyone involved is primarily interested in safe quality racing as the highest priority because they are personally invested and work at the track because they love racing. Saturday was the first day of two race days. Our expectations for the day, as underdogs, were to have fun racing. The drivers Jason would be up against were some of the best, and this was primarily an opportunity for learning. His lap times were very good but a few seconds off the pace. Our friend Brandon, who has helped us at Concept Haulers, was there and helped Jason drop a few precious seconds per lap with some coaching. Jason ran a great race and definitely shows the hallmarks of a budding driver. He managed to stay on the lead lap even with a few mistakes, and only a second or two off the pace. The more he races the faster he is going to get. The truck did not fair so well, it dumped all of its power steering fluid and was really hard to steer. Brad Kline, Brandon’s dad helped us get some steering fluid, but it quickly leaked out. We decided to park it at the track overnight and the Mersburgers let us put the kart and tools in their trailer overnight. At that point, we were going to have to stay until Monday and wait for a shop to open. In the mean time we can Focus on racing. The weather for Sunday’s race had it’s own special excitement – a forecast for rain. Most club races don’t race when it rains. 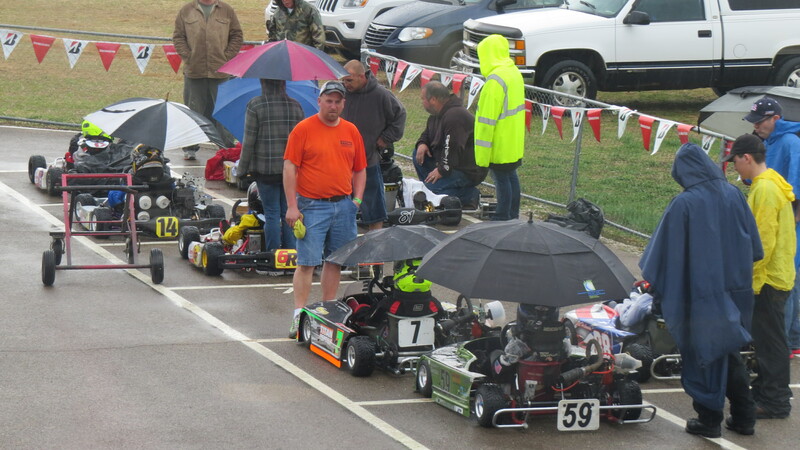 Since this was a WKA feeder series and a more serious event, they still race when it rains. To keep the day short and try to beat the rain, practice was limited to one session. Jason qualified third. All but the last two classes qualified in the dry. The second to last class was red flagged as the rain came in, and teams were given 15 minutes to change to a rain setup. At that point everyone else the needed to change to a rain setup and it was officially a rain race. Knowing this was coming and most of our adjustments we done; we moved wheels in the front out and rear wheels in and put the rain tires on. 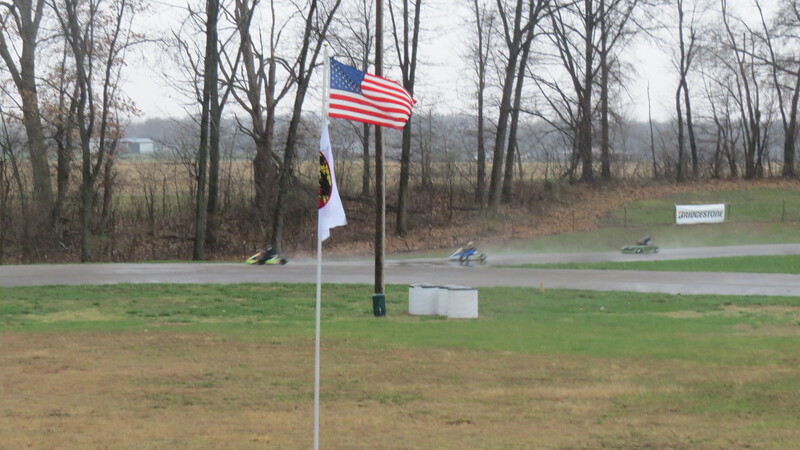 If you have an opportunity to watch any motor sport race in the rain, definitely take advantage of it. The whole dynamic of the race changes, it requires the driver to change almost everything about how they take to the track. The racing line is different – wider and smoother. Throttle and brake control need to be very precise. Drivers that are fast in the dry suddenly become slow and cautious, and occasionally the slow guy runs away. Jason listened to his coaches and took their advice to heart for the pre-feature and took the wet track like a duck to water. He started the race in third position and his class was behind a two cycle class. At the green flag he jumped out from behind the pole on the inside and made a beeline for the first corner, beating his competition. He headed off the two other drivers for three of the six laps until his kart started to become unresponsive to the motor and was passed at the first tight corner by both of the drivers behind him. 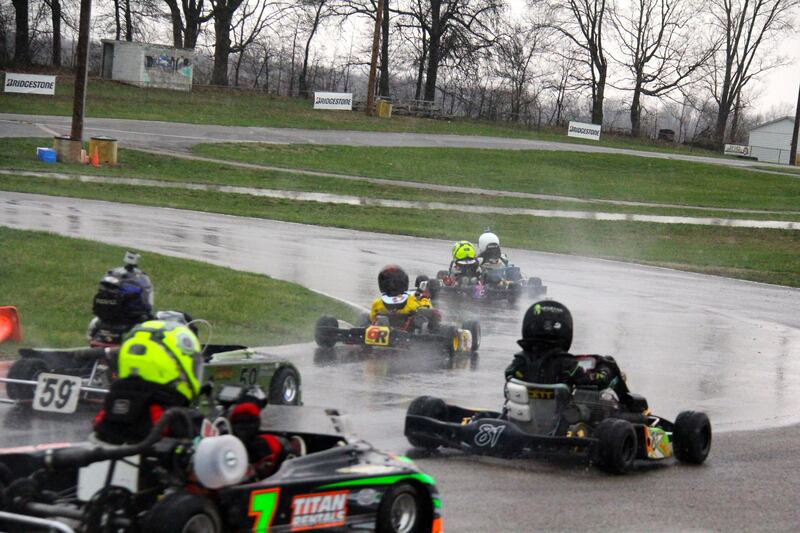 He kept the kart going and managed to stay on the lead lap, limping the kart to the checkered flag. During the break between the next race we looked at the kart. We did not find anything obvious, but suspected that the clutch may have issues. 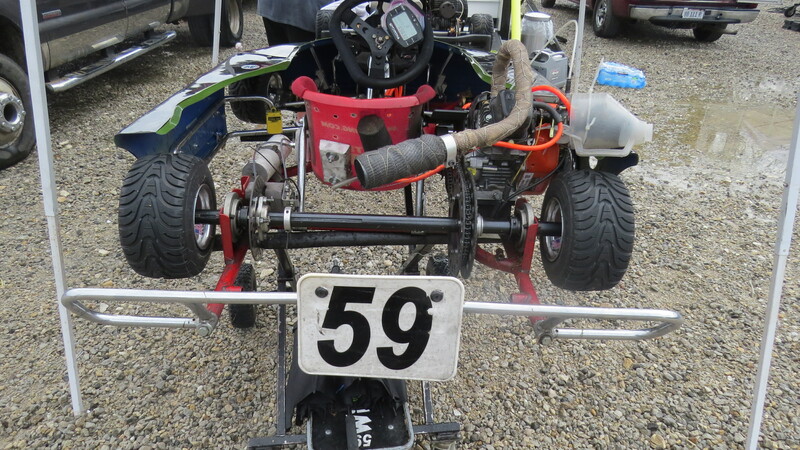 Jason took the kart out to the track for the feature, driving as fast as the kart could, until it just stopped working. He put in a great effort and again stayed on the lead lap for all 12 laps despite throttle problems. This first race put lots of challenges in front of us. Some of them on the track and some of them off. Jason kept his cool and focus on the moment, not letting problems with the truck, rain, or kart distract him from his goal. Since we had no chance of fixing the truck during the weekend we worked on the problems we could solve and had a lot of fun. Adding an extra night to our trip was not too much of a inconvenience, except for missing work and school, both of which we will have to make up later. On Monday the truck was road-worthy by 10 am and we on the road home with stories to tell our family and friends. This next weekend we are off for the holiday then its back to our second home Badger Kart Club on April 27th for their non-points race and some practice before the Sprint Series race on May 9th. If you are looking for something new to do stop by the track and see the racing.